Private Villa fan cooled on both levels with traditional high Balinese ceiling .The mezzanine bedroom with ensuite has views across the rice padis to Ubud and Mt Agung . 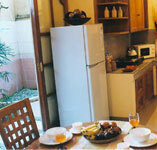 Living, dining areas including kitchen and open Balinese new style bathroom downstairs. 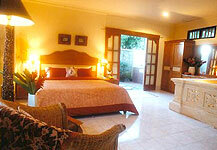 Fully air conditioned Villa overlooking tropical garden and pool. Double bed ,ensuite and large balcony upstairs and twin beds, ensuite and large verandah downstairs .Both ensuites are new and in an open but private Balinese garden style. Suits Family of 4 or close group of 4. 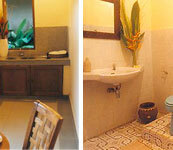 Spacious air conditioned rooms with new ensuite in an open but private Balinese garden style. Breakfast can be taken in our restaurant or served to your balcony or verandah which overlooks the tropical garden and pool. Spacious fan cooled rooms including large dressing room and bathroom with shower and bath. Breakfast can be taken in our restaurant or served to your large balcony or verandah which overlooks the tropical garden and pool. 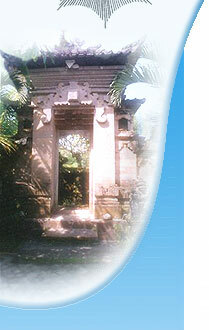 Ubud is about 25 km north of Denpasar and about 40 minutes drive from Ngurah Rai International Airport. 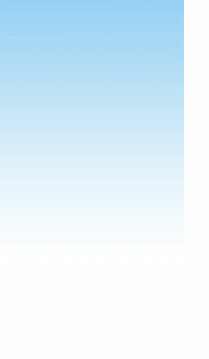 The cost of our personal transfer from the Airport to the Villa is US$10 per vehicle. A friendly member of our staff will be at the airport to meet your flight and welcome you to Bali. The Villa Kerti Yasa is situated in the artisans village of Nyuh Kuning separated from Ubud by the Monkey Forest. We are on the road Jalan Nyuh Bulan , past the Nyuh Kuning football field and Banyan Tree, which ends at the southern end of the Monkey Forest.